Tony Gibson enjoyed arguably his best ever autumn since joining the Dynamite team, landing several notable fish including his first ever UK fifty thanks to help of CompleX-T! Tony’s first ever UK 50! Tempted on a CompleX-T corkball pop-up. What a fish’! With the success of the July eel session still fresh in my mind, I was keen to get back to the same venue for another crack at the eels at the earliest opportunity. That opportunity eventually came in the first week of September, with a spell of warm settled weather and I quickly planned a 2-night session. As I was the only angler on the pit when I arrived, I could have gone straight back into the swim that I’d caught the eels from earlier in the year, but as the venue was still quite new to me and the eel potential relatively unexplored (by me at least), I was keen to try a different area. With the pit being relatively shallow, I wanted to present my baits hard on the bottom and therefore I wanted some nice clean areas to ensure my presentation was sound, with my baits clear of weed and my running ledger rigs free to operate as they should without being clogged up with weed. However, the abundant weed growth made the task of finding a swim that I was happy with quite difficult, but eventually, after nearly two hours work around one end of the pit with the marker float set-up, I’d found a swim that I felt suited my requirements. As I could fish three rods, I chose two different spots within the swim to target. To the side was a close-range spot near some overhanging branches for one rod, while the other was further out, in a relatively clear area surrounded by weed, which would accommodate the other two. As I’d done on the previous eel trip, both the areas were treated to a couple of spods of 8mm Dynamite Meaty Pellets that had been prepared by emptying a couple of packets of the pellets into a bucket, then tipping a bottle of ‘Fish Gutz’ and a few generous squirts of XL Liquid Worm over the top before shaking and simply leaving the pellets to soak up the liquid attractors for a couple of days. Trying to fish lobworms on the first eel visit had produced regular interference from perch, so this time around I planned to use deadbaits straight away and set about snatching a few small roach and perch on a float rod and maggots. I took some lobworms as a backup, in case snatching fresh baits proved to be a problem, but fortunately catching a few little roach and perch proved to be relatively easy. Both rods were baited with small half baits mounted on size 7 hooks attached to a short 45lb Quicksilver traces and incorporating relatively heavy leads for the minimal resistance rigs to help maximize early bite indication and minimize the risk of deep hooking. On each cast a PVA mesh bag of the pre-soaked pellets was nicked onto the hook to help concentrate the attraction around the hookbait and prevent tangles on the cast. The first evening produced a few decent perch as a nice bonus, with the best an ounce shy of 3lb., then I went on to experience a frustrating number of short, dropped runs during the hours of darkness, which I put down to small eels. Fortunately, sticking to the same tactics eventually paid off, as on the last night I received three proper runs. The first was missed completely. The second run, occurring around midnight, resulted in a hooked eel, which spent most of the fight up near or on the surface, and looked to be somewhere between 3 and 4lb by the light from my head-torch. Unfortunately, this fish fell off, just as I was drawing it over the landing net. However, the disappointment of the missed chance and lost fish didn’t last too long, as a third and final run around 3:30am produced a lovely 5.02 eel on a small perch tail section. 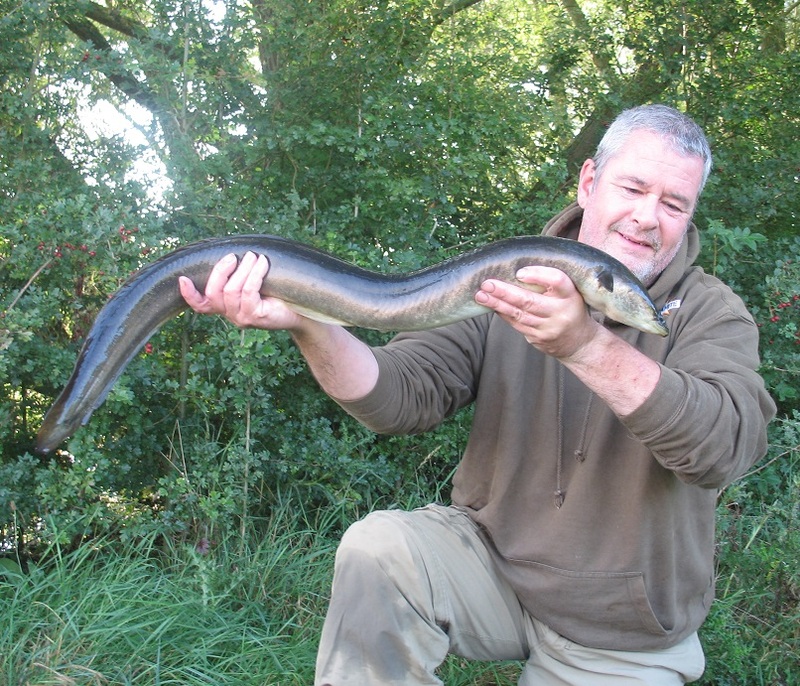 The largest eel I’ve had for quite some time and a fabulous conclusion to the session. 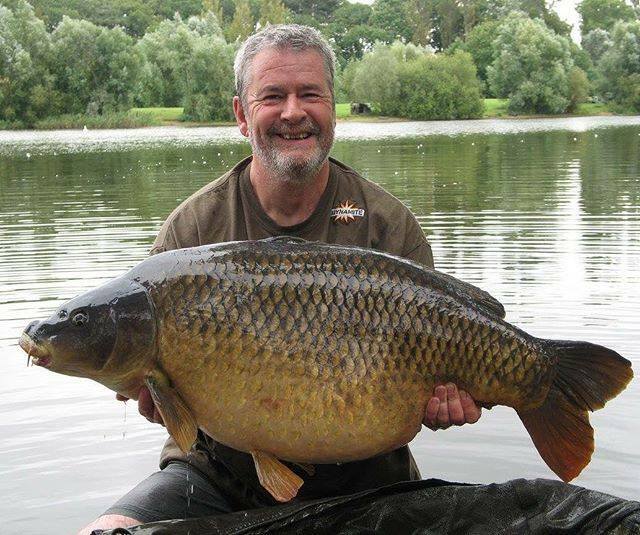 The early autumn period often sees the first of the proper post-summer low-pressure and big wind weather changes that usually see some of the country’s big carp getting their photos taken. I’d been keeping my plans reasonably fluid, while keeping up-to-date with the longer-range weather forecasts, so when the weather apps indicated just this type of weather on its way I was able to arrange for a mid-week session… with a big carp from the Bluebell Complex’s Swan Lake firmly on my mind. As usual it was quite busy on my arrival, but I had the choice of two swims that I quite fancied; eventually choosing a swim that was coming free on a stretch of bank that I hadn’t fished since the previous year. Swan is often regarded as a small bait/particle water, but with the success I’d been enjoying on the CompleX-T over the previous 12 months or so, especially as I seemed to be catching more than my fair share of the larger fish, I was more than happy to stick with the bait and use a ‘boilies only’ approach. Once I’d got my main target area in the swim located and highlighted with the marker-rod, I didn’t hesitate to make an initial introduction of around 5kg of CompleX-T in a mix of different sizes. Standard 12mm, 15mm and 20mm round boilies and a good helping of 14mm barrels were all introduced to the main area between 65 and 70 yards out with the aid of a spomb. I fished three rods. Two right over the main baited area and one fished just off to one side of the bait. One of the rods over the bait and the one just off it sported 15mm CompleX-T cork-ball pop-ups, while the hookbait on the third rod was a standard bottom bait, straight out of the bag. The first night of the session started quietly, with just the one carp, a mid-twenty, out elsewhere on the lake. I’d not seen a sign of a fish anywhere near my swim and I was starting to get “itchy feet” and was considering a move. However, two low 30’s were caught later in the morning, from the opposite end to where the mid-twenty had been caught. This actually helped to settle me a bit, as I was roughly mid-way between the two areas that had produced and I suddenly had the feeling that the big fish were starting to respond and move about due to the freshening conditions and I was in a good interception area. Therefore, with two nights of my session to go, I decided to introduce another 3kg of mixed sized CompleX-T boilies to my baited area and at the same time refresh my hookbaits. While redoing the rods I also took the opportunity to move the end-tackle that had been presenting a single hookbait to the edge of the baited patch from the left-hand side of the area to the right-hand side. On the cast the lead hit the deck with a proper firm ‘bang’ and I told myself that I wasn’t going to move it again unless a carp moved it for me, or it was time to pack up. As it happened, it was the last morning of my session and I was well on with the job of packing up, with only the rods left on the rests and most of everything else already stashed back in the car at the back of the swim, when the right-hand rod signaled a steady run. It felt like a decent fish when I first bent into it, but it came in relatively easily and without any drama, so I had it in close quite quickly. When the fish turned over just under the surface, just under the line of the middle rod, I got the impression that it wasn’t particularly big, and I didn’t hesitate to boss it a bit to help ensure that it didn’t tangle with the lines on the other rods. However, a few seconds later it suddenly seemed to grow dramatically, as it came wallowing up to the surface and allowed itself to be drawn over the net cord at the first attempt. 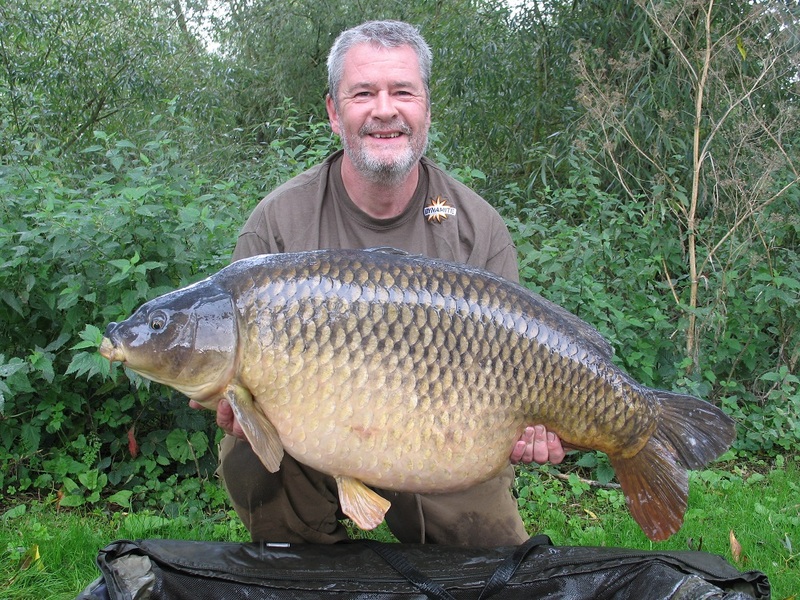 As soon as I got a good look at the carp in the net I was able to identify it as the Box Common and a potential PB. When it was first weighed, and my mate Geoff called out 50lb 2oz, I actually asked him to go through the procedure again, as although it looked nicely filled-out and in great condition, I was still for some reason expecting it to be big 40’s rather than a 50. However, the second time around Geoff came to the same conclusion as he and the other anglers who had gathered to see it confirmed a weight of 50lb 2oz and my first 50lb+ carp! With a continuation of some great conditions over the next few weeks it was tempting to keep going back to Swan to see if I could bag myself either of the two largest mirrors, which were really my last remaining target carp from the water. However, I decided that it would be nice to leave the big mirrors as motivation for return visits in 2018 and to switch the focus of my attention to the inhabitants of the River Great Ouse for the rest of the autumn. I’ll let you know how that panned out in my next blog.